The brilliant career of Sanjeev Charurvedi seems to be hitting the wall, with the Central Administrative Tribunal (CAT) issuing orders to the Union Health Minister, JP Nadda, and the AIIMS Director to restrain his (Chaturvedi’s) annual performance appraisal. The decision comes as another blow to Chaturvedi’s admission, now as an Indian Forest Service officer, contrary to the title of whistle-blower tagged on him. During his stint as chief vigilance officer (CVO) of the institute from July 7, 2012 to August 14, 2014, Chaturvedi has been accused of conducting unlawful activities, and not meeting the standard of the CVO designation, by the then Union Health Ministry led by Dr Harsh Vardhan in 2014. Chaturvedi has been continuously citing in media the fact that the cases of corruption exposed by him, is the chief reason for the government wrath on him. He has then exposed a 1982 batch cadre IAS Officer, Vineet Chaudhary, the deputy director (administration) AIIMS. 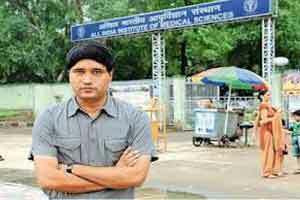 Subsequently, Chaturvedi was transferred from the post at AIIMS in August last year and was presently working as the deputy secretary In the Indian Forest Department. The action by the central government, under the supervision of Dr Harsh Vardhan (the Union Health Minister), drew a lot of flak from the AIIMS officials. A signed petition by AIIMS, clearly stated the fact, it is common knowledge that in the last two years, Chaturvedi has brought to light a string of corruption cases at AIIMS. In turn, all this has been conducted under the able leadership of the CVC. Under no circumstances the CVO should be removed without the approval from CVC, the petition is implied to have said. Restraining them from rewriting Chaturvedi’s APAR (Annual Performance Appraisal) till its further order, Centre Administrative Tribunal has issued a notice to them and sought their response within two weeks while posting Chaturvedi’s plea for June 30, for further hearing. Chaturvedi has moved the tribunal contending Nadda, who is the president of AIIMS, and other AIIMS officials have attempted to nullify or rewrite his APAR for a period (April 1, 2014-July 15, 2014) for which he claimed to have “already attained finality with ‘outstanding’ grade”(as quoted in the media reports-www.dnaindia.com).